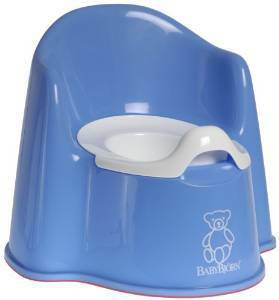 BABYBJORN Potty Chair $19.99, down from $29.95! You are here: Home / Great Deals / Amazon Deals / BABYBJORN Potty Chair $19.99, down from $29.95! Are you getting ready to potty train? If so, here’s the perfect potty chair for you (especially for boys!)! Head over to Amazon and get the BABYBJORN Potty Chair for $19.99, down from $29.95. There are a variety of color choices, but right now the only ones at this price are blue, pink, red, or white. Super Saver Shipping will be FREE with an order of $35 or more or get FREE 2-day shipping with Amazon Prime.